For a union that represents over 12,000 members across the province – including some outside of B.C. – member engagement and making personal connections can be a challenge at times. MoveUP’s table officers – who work full-time for our union – have the biggest name recognition for members but there are only five of them – the President, Secretary-Treasurer, and three Vice-Presidents – and while all would love to have more opportunities to meet with members on a regular basis, there are also other obligations relating to the day-to-day operations of our union that keeps them grounded. 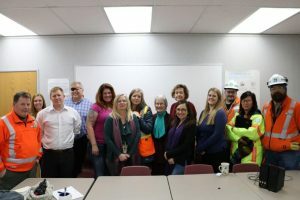 Union representatives often conduct site visits, especially during times when bargaining is near or there is a pressing workplace issue, but in general if they must deal directly with a member, it usually means they are dealing with a grievance. In other words, they never field a call from a member who just wanted to tell them how they’re doing a great job and that they’re having a great day at work. 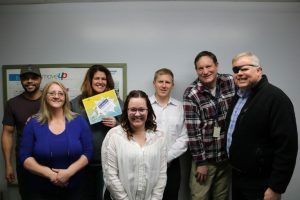 But not all workplaces are the same and many, especially outside of the Metro Vancouver area where MoveUP’s headquarter is based, have unique challenges. MoveUP members working for BC Hydro on the Site C Dam or at the Gordon M. Shrum Generating Station next to W.A.C. Bennett Dam are among those that face a unique set of challenges. 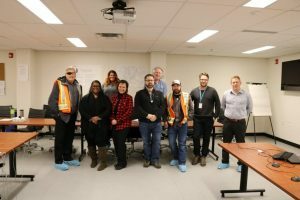 Although they operate under the BC Hydro collective agreement, many have specific very concerns because of the unique nature of the project or their workplace. For those unfamiliar with GMS, according to BC Hydro’s website, all of their customers use electricity that comes from that generating station. These members deal with issues that perhaps other members who work close to home aren’t as concerned about, including lodging, relocation expenses, travel expenses, and scheduling. Because they work in remote areas that are far removed from MoveUP’s head office, they often look forward to their opportunities to interact with the union not only to bring up those aforementioned topics but to discuss other things that are happening with the union as well as issues that are more common at all workplaces including such things as contracting out, bargaining unit work, appropriate pay scales, advancement opportunities, and bullying and harassment at the workplace. On January 8-9, MoveUP President David Black, Vice-President of Utilities Rysa Kronebusch, Union Representative Tony Geluch, and Communications Officer Daniel Fung traveled to Fort St. John and the Peace River Region to meet with many members working at BC Hydro at those two aforementioned sites, as well as at the Community Consultation Office and the District Office in Fort St. John. 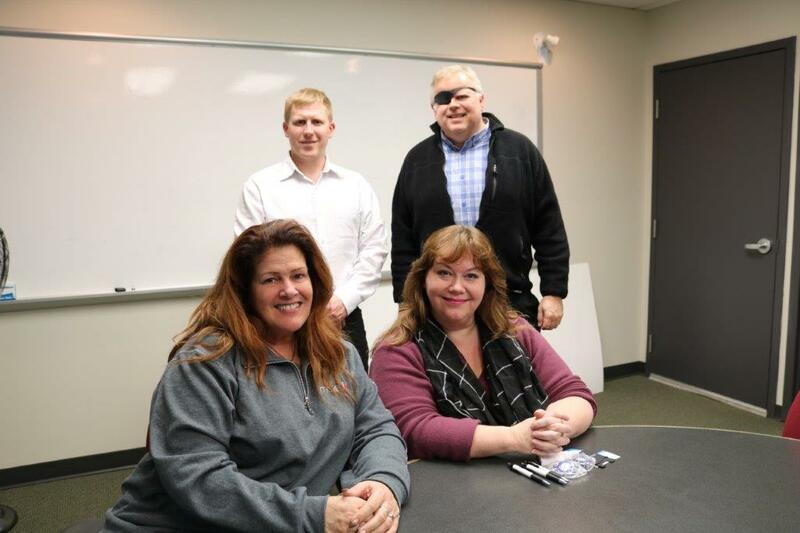 This was an opportunity to not only meet again with existing members, as well as encourage more to become job stewards, but also to meet newer members or those who had not previously attended a union meeting. These members want to feel our union’s presence to know that we are there in solidarity with them. Members situated in the Metro Vancouver area, on the other hand, can interact with our union more conveniently and therefore might not have the same level of desire for site visits. They also have more opportunities to participate in many of the social events that take place in the Lower Mainland which some of our members working in more remote areas of the province unfortunately don’t have at this time. During this particular trip. 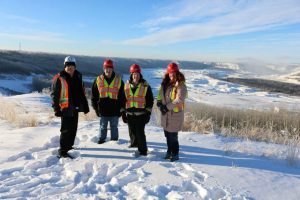 MoveUP executives and staff also received a guided tour and update on the status of construction at the Site C dam. The last tour our organization had of the construction site came back in September 2017. Although the project has proven to be controversial in the public realm, it is important for MoveUP to keep as informed about the project as possible so we can serve our hard-working members – many of whom have made tremendous personal sacrifices to relocate or travel to that area for work – to the best of our ability. No matter where your office is located in relation to MoveUP’s Burnaby headquarters, we encourage all our members to take the opportunity to attend meetings held during site visits to meet your union reps and other MoveUP executives, to share your voice about what’s going on at your workplace, and to learn more about what our union is doing and how it relates to you.